Once in a while, as an artist I will have an idea that I need to explore, even when I have no clue where it might lead. It is a bit like an involuntary response, the idea sounds like fun so I start to play around with the ideas in my head till I have to do something about it and make something. This project is one of those, my long time friend Don Bethman who is an artist and illustrator was looking to work together on some bizarre portraits. Don graciously volunteered as the subject and we were off. Don collected up a bunch of props like, clothing, wigs and eyeglasses and we headed to my studio. The idea was to deconstruct the standard portrait photo, so, backdrops and lighting would stay fairly constant, even the model would stay constant but we would change the subject in ridiculous ways with the help of multiple exposures and photoshop. The lighting arrangement was really straightforward. The key lighting on all of the shots was a 60” octabank, which is just a large soft box. A small 16” soft box provided the rim light and a grid spot on the background helped with separation and a little drama. This configuration worked for all of the shots except for the old masters painting, which simply used the octabank. For this painting a single light was more in keeping with the Rembrandt style lighting. You should know that Don’s usual state is with a lot less beard. He has been feeding and grooming it for months with these photos in mind, so there was plenty of reason to get a good photo just to memorialize the occasion of such a magnificent hirsute facial sculpture. So we began shooting without much in mind except capturing his beard in humorously awkward pose. Within a few snaps I started seeing Don as looking a bit like a swami or guru, and started think a third eye would be funny. So we got the shots with the glasses on, then without moving shot Don with the glasses off. This way I could isolate the eye and place it on the forehead. Then we photographed the glasses against the background, including the sides, so I would have bits of glasses to work with in Photoshop. This one was shot on the same day as the Triclops image. I was able to silently alter the colors to give it a bit of a different look. I was able to change the background and shirt, to try and keep the portraits from looking repetitive. It was a little bit of a challenge masking in the face and fitting it up under the mustache. The effect really started to come together when I used my Wacom tablet and used a paintbrush at one to two pixels and drew in hair. I then blurred by about a pixel with gaussian blur and added a bit of noise to blend it all in. In the end the repair was fairly invisible and really helped sell the illusion. I got the idea from a meme I saw a few years back of different celebrities that had been given the mustache hair treatment. I figured I would try and do it Don and make it as believable as I could. Once I had the first two portraits finished the ideas just started coming. Almost as a challenge, what else would be fun to try and do with compositing and Photoshop? Two heads sounds like fun. Don had the idea to try two distinctly different personalities for each head so we styled each side differently . There was the life of the party on one side with crazy glasses, a messy beard and Hawaiian shirt looking like he is having the time of his life and the more straight laced quiet type looking annoyed. It was interesting to try and play off of the other characters emotions when there was no-one there. For the shirt it was a fairly simple workaround. We buttoned the two shirts together and safety pinned them in back, then pulled the shirt open enough to leave space for the other head then shot a bunch of each character so we had plenty of expressions to choose from. Don had an amazing pair of thick glasses that made your eyes look huge, and I figured it would be a perfect match for a gigantic super-villain sized noggin. I started by making the initial portrait. Then I made a number of close -ups all around the head. Then finally I got the size and shape of the head by taking pieces from other photos of Don’s head and using transform-warp to fit the parts into shape I wanted. Keeping the skin uniform was the biggest challenge so I tied it all together by using frequency separation and cloning just the skin texture to the appropriate spots. I Exaggerated the eyes a little bit more that the glasses. 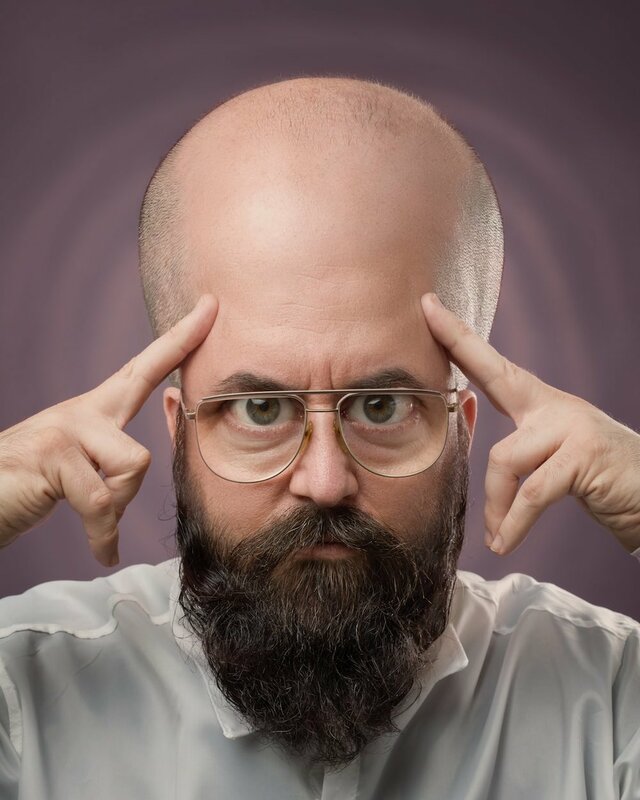 The mind control waves were natural and a product of the crazy glasses but if I had to make such an effect, I would use a paintbrush, gaussian blur and then use a layer mask to tone down the effect on the portrait. So this idea was probably the germ that started the whole project. Don and I had been talking about reproducing a portrait of the original Dracula with Don as the subject for a few years. Once we got moving on this project it made the whole idea far more within reach. We would use cheap costume elements that could be slapped together easily. Anywhere we could substitute something cheap for the real thing, we would. If you look closely the costume is composed of gumballs, cookies, bubble wrap , a paintbrush and some fabric. There was no sewing, only hot-gluing. In the end, we both had a blast making the images. I could imagine them being used as stock for advertising, but I am not sure really how how I will use them. What I do know is it gave us both a chance to stretch our creative muscles. It isn’t how I typically work but it forced me to challenge my retouching skills, and hopefully opened some new doors and dusted off some old techniques that might shape my work in the years to come. Thanks for reading! If you would like to follow this project and how it develops it can be found here at: The Portrait Project.